Usually, I grocery shop once a week. I think it's cheaper this way. I plan the menu ahead and don't buy more foods than I need. Okay, hardly any more... Most foods are kept fresh easily in the pantry, fridge or freezer, but I always had a problem with lettuce. I eat lots of salads and usually buy two or three heads of different kinds of lettuce at once. But even when I kept them in the crisper drawer in the fridge, they would still go limp after two or three days. A friend of mine, who's a restaurant chef, knew a solution. 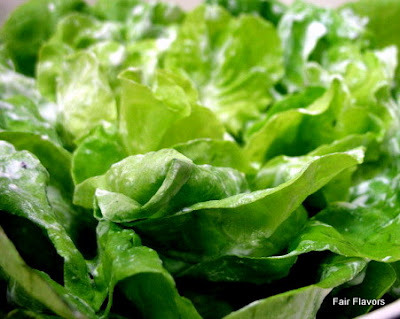 First, take off the already bruised or bad leaves and discard them (I assume you bought good lettuce, so there won't be many bad leaves). Cut off the end that holds the head together. 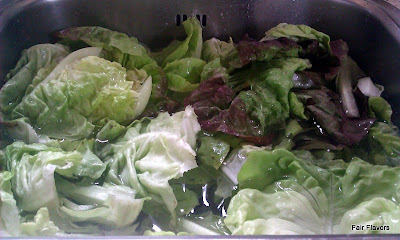 Fill up your sink with fresh water and put the leaves under water. Give them a good wash/rub, to get rid of dirt and critters, drain the water and refresh. Now let the leaves sit there for half an hour to an hour. This allow the leaves to soak up as much water as they can, which keeps them crisp longer. Use a salad spinner (if you don't have one, you can use towels, but you should really get a salad spinner! They're cheap and incredibly useful) to dry the leaves. The next step is to roll the leaves in paper towels. I like to do that in portions, so I can take the right amount for one salad out the fridge, without having to re-wrap the rest. Just take a bunch of leaves, lie them on the end of a towel and roll it up. Put the bundles of lettuce into a plastic bag and put in the fridge (use the crisper drawer if your fridge has one). 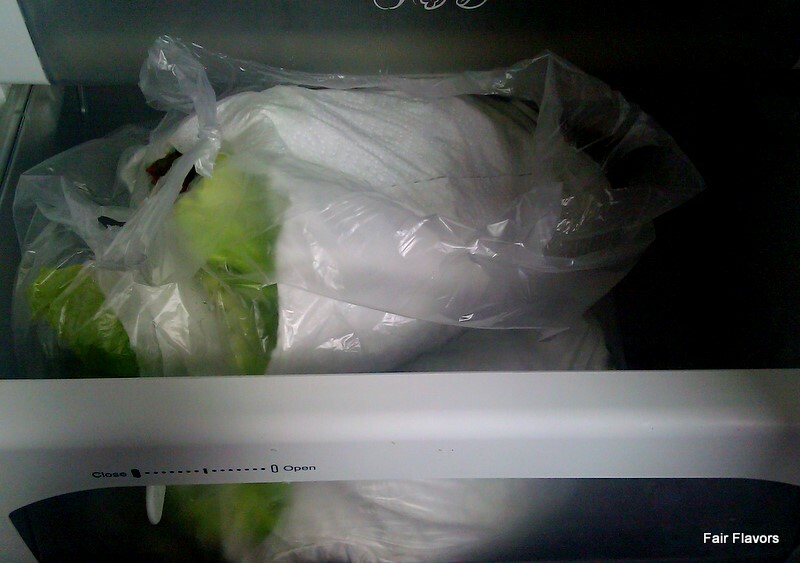 This way you can keep your lettuce fresh and crisp for at least a week. Maybe more, but I haven't tested that yet. that uses up plastic and paper. 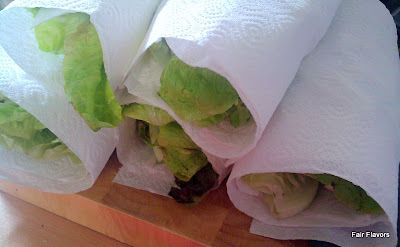 you can get lettuce keepers that work for a couple weeks with romain, and about a week and half with red leaf. havent tried with other kinds.